Many people think of Revelation chapter 19 as the chapter that describes the Second Coming but, as we have seen, the Second Coming (downloadable PDF diagram) is referred to in several places throughout the book of Revelation. This is after John saw the events related to the judgment of Babylon but seemingly before the Second Coming which is related in verses 11-21. God is being praised for his judgment upon Babylon which is completed and seen to be "true and righteous." It is possible that verses 1-10 are post second coming with a flashback in the rest of the chapter to detail the events of the second coming. The first half of this chapter is filled with praise and worship. The identity of the 24 elders is discussed here. Whose voice is this? It comes out of the throne. Jesus is described as being "in the midst of the throne"
He also has been recorded as referring to His Father as "my God and your God" and thus it would be appropriate for Him to say "our God." This version uses "Yahweh" the personal name of the Father and "Hallelu-YAH" or praise YAH where Yah is the shortened version of Yahweh. So verse six could be just describing the Son giving praise to the Father Who is the God of all. By the time verse ten comes, it is apparent that an angel is speaking to John. What is not clear is at which point of John's record the angel starts speaking. It may be this verse or is may be at verse eight. How does she make herself ready? That seems to be related to the next verse. "Blessed" or happy are those at the marriage supper. I guess so! 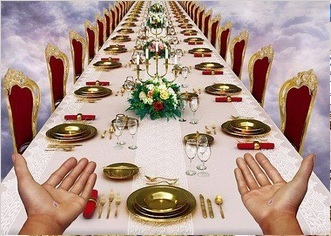 Those who attend the marriage supper also receive eternal life. What are "the true sayings of God?" Would it not be the things just said in verses 6-8. We are to worship God only meaning the Father and His Son who is God by virtue of being begotten of His Father. A separate page will look in more detail at the testimony of Jesus and the spirit of prophecy mentioned in this verse. The scene in Revelation chapter 19 now shifts from one of worship to preparation for the Second Coming indicating that what came before was just prior to the Second Coming. 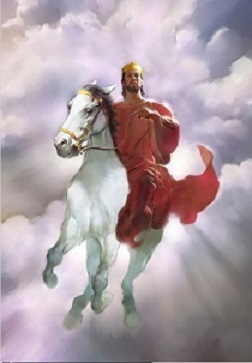 Jesus was described as riding a white horse in chapter 6. Again, "war" is translated from the Greek word "polemeo" "polemeo" (Strong's G4170). The name that Jesus receives is just one of many names. The next verse tells us of one of His names. Why "dipped in blood"? Isaiah 63:1-6 seems to connect to this. The blood may not be from a literal slaying of the enemies of God - the order doesn't seem right for that. It may be more like His name written on His thigh (on His vesture). The blood stands for the life. 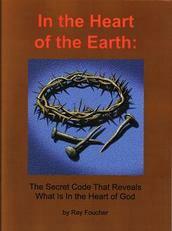 It could even indicate the blood of the martyrs whom He has come to vindicate and raise from the dead. Who in this verse is clothed in fine linen, the armies or the horses? Verse 19:8 told us that the fine linen is "the righteousness of saints." Some have suggested that those who "followed Him" were not on the way to earth but on the return to heaven. It is apparent that this sword is symbolic and is pictured as coming out of His mouth. To "rule them with a rod of iron" sounds very harsh but the word rule (Strong's G4165) is most often translated as to "feed" and it comes from a word which means to shepherd. This is not referring to ruling as in what we would call the iron-fisted rule of modern despots but more like the gentle leading and care portrayed in Psalm 23. Then why would Jesus have these titles, which refer to His Father on His thigh? There is no problem. It doesn't say it is His name. He can have His Father's name written on Him. Jesus is the One Who is championing His Father, working to bring an end to the great controversy over His Father's character. The angel is not literally "standing in the sun." It may be a way of saying that He is standing near a source of brilliant light - the glorious light of the divine presence. Think of "the brightness of His coming" (2 Thess 2:8). This angel could be standing near the Son of God much as an armorbearer would stand near his master. The reference to the birds is typical of the common language of the day in regard to one combatant challenging another. It may also have been a way to indicate that the victim would not be buried. The day before I wrote this is saw about 20 large ravens circling near our house and then found a deer carcase in the bush. Or, it may be mostly figurative language. It's interesting that the list of the groups of people mentioned: "kings," "captains," and "mighty men" is similar to those mentioned in Rev 6:15 who have just been asking the mountains and rocks to hide them. It should also be noted that horses can represent groups of people - see the discussion on Revelation 6 about the four horsemen. It is the beast, the kings and their armies that are gathered, not all the people of the earth. Many physical wars first start out as arguments or disagreements about something and then escalate into physical violence. The terms "beast" and "false prophet" identify systems, not individuals although they may be headed by a single individual at the end. Where is the "lake of fire"? The Bible does not define it as a place but rather as an experience - the second death. The groups of people listed in the verse above experience the second death. The uses of "fire and brimstone" in association with the lake of fire is very interesting - we will look at that in chapter 20. Each of the three verses quoted above (Rev 20:6, 21:8 and 22:19) use the word "part" in the sense of taking part in something. 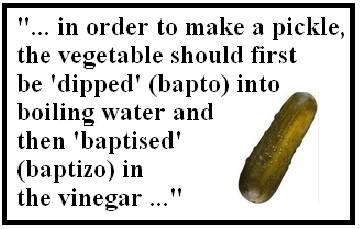 There is an interesting use of this word in Colossians. The word "respect" is translated from the same word (meros, Strong's G3313) that is also translated as part in the three verses we are considering. We might speak of not being judged in respect to our beliefs, whether we keep something or not. But Paul is not saying do not let anyone judge you whether you keep it or not. Rather, he is saying do not let anyone judge you for taking part in an holyday etc. He is speaking to people who do observe these things. See more discussion here of the meaning of "meros." There is further reasoning that the beast and false prophet referred to here are systems and not individuals. The second death is eternal separation from God and from life itself. There is no resurrection from the second death. If verse 20 was speaking of individuals experiencing the second death at this point, they would be exempted from the second resurrection at the end of the millennium and the judgment that happens at the great white throne. You can't die the second death twice; it is final. The "remnant" is not simply a word to define the last part of God's people. It has to be understood in the context; you have to determine the identity of the group under discussion of which the remnant is the last part. In this case, it is those who were not killed by any of the disasters, plagues etc.